What better than taking a walk down memory lane and creating crafts? Each project is a treasure trove of memories. Vintage cloth, found objects and embroidery combine to create textiles that tell a story. Shabby chic keepsakes that make a house a home. Discover layering, collage and other fabric skills to create meaningful artworks that celebrate your most treasured memories and perhaps even become family heirlooms. This book includes design inspirations, tools, objects, techniques and 15 wonderful projects. The projects include a needle case, cloth book, stitch bobbin, journal, quilt, stamped fabric, wall hanging, hoop art, panel, book cover, book wrap, purse, heart, patchwork and tags. Practical projects that anyone can achieve. 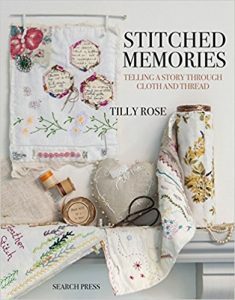 A wonderful book for all lovers of vintage and country style.